These images have a lot in common. They were both captured by remote video technology on deep sea oil drills. The first video was captured at the depth of 7828 feet and the second at about 5000 feet below the surface. The organism featured in each video was billed in news stories as a "Monster"- Am I the only person in the world that gets a little sad every time a deep sea organism gets billed as a monster just because they don't show off in front of cameras all the time like dolphins (total media whores)? In fact, neither one of these things are "monsters" (whatever that word implies- I think it implies teeth and intent- two things neither of these animals posses) and they were both already known to science. The first video is probably of a Magnapinna squid. Specific identification is difficult, not because it's a grainy shot, but because researchers have never actually collected the adult form of this squid- its taxonomy was worked out from larval and juvenile forms (these are more easily collected at the ocean's surface- pelagic organisms migrate into deeper water as they mature) so scientists are guessing that this particular specimen belongs in the same family as those forms (Magnapinnadae). The last thing that these videos have in common is that they offer images of organisms that are rarely seen and difficult to collect and analyze. But science is coming to know more about them through the use of manned and unmanned vehicles and video technology. The study of deep sea organisms has proceeded slowly. In early marine expeditions such as the Challenger expedition of 1872-76, researchers sampled and surveyed pelagic organisms by dredging and netting off the ship. While this method brought up a variety of specimens, certain groups of organisms, especially those that are gelatinous or fragile, were mangled in the process and identification was difficult. William Beebe pushed the process of exploring these organisms forward with his bathysphere. 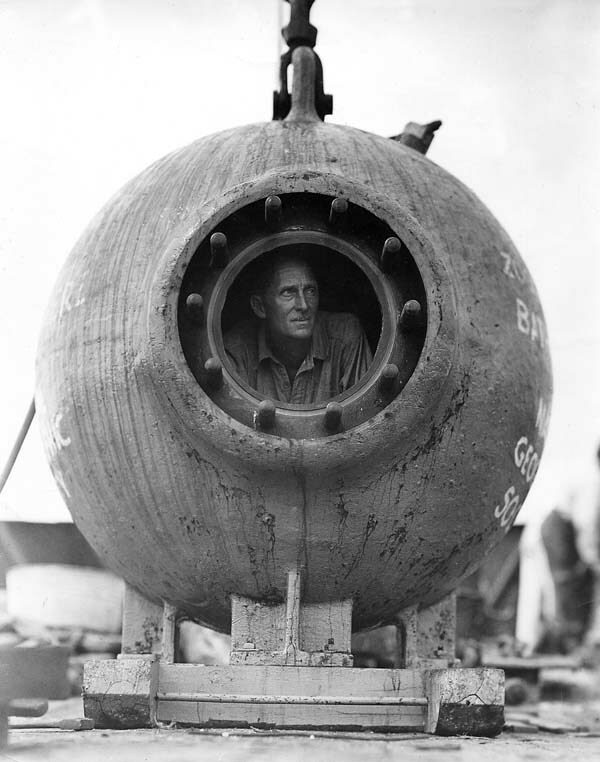 Between 1930 and 1934, Beebe used his submersible to observe deep sea creatures in their native habitat. He described quite a few new species (some have never been seen again). But there were some problems with the bathysphere when it came to consistent study of the denizens of the deep. Beebe had no ability to grab the specimens he saw so the only way to "see" the specimens was through Beebe's descriptions and the illustrations produced by his illustrator, Else Bostelmann. Underwater photography and flash was not advanced enough to take photos out of the bathysphere at great depths. Beebe took notes and made drawings during the dive, and he was also connected by radio wire to Else on the boat. She took notes and made sketches based on these real time descriptions and combined with Beebe's own notes and imput, produced some pretty unforgettable images of these newly discovered pelagic organisms. Else Bostelmann's illustration of a new pelagic species seen by Beebe in the bathysphere. These research platforms have come far since Beebe's work in Bermuda. Both HOVs (human occupied vehicles) and ROVs (remotely operated vehicles) are used to give researchers direct access to organisms in their habitat. Scientists can study behavior, interactions between species, and physiological measurements; in addition, they can take photographs and video for further study. According to Bruce H. Robison, high-resolution video systems attached to these vehicles can perform quantitative surveys as accurate and useful as those conducted with nets. In addition, they can capture images of delicate organisms such as the Deepstaria. 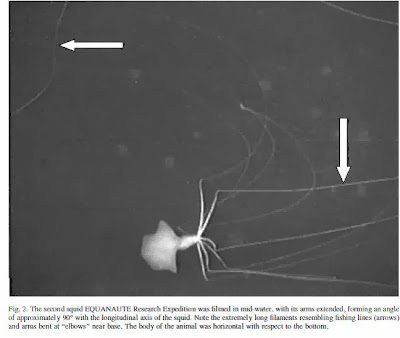 Another plus- most gelatinous pelagic organisms are transparent, so the video recording does not merely display the features of the main specimen, but often the prey is visible in the digestive tract (I know, super cool!). Observations of pelagic animals has increased due to the use of HOVs and ROVs. In 2002, Guerra et al. described some of the advances teuthologists (people who study cephalopods) had made working in HOVs with video attachments, including new behavioral patterns (Vecchione and Roper, 1991), light displays of octopuses (Johnsen et al 1999), a description of a new genus of cephalopod living in hydrothermal vents (Gonzalez et al, 1998), and new types of locomotion (Villanueva et al, 1997). Guerra et al. reported a series of cephalopod observations made with HOVs in 1988, 1992, and 2000. Guerra et al. tentatively identified the specimens through video footage and still photographs as belonging to the megapinnidae family. At the end of the paper, the researchers state that "It is amazing that a large and completely unknown animal has suddenly been observed in the last ten years at similar bathypelagic depths in the Indian Ocean, Gulf of Mexico, and western and eastern Atlantic (Lindsay & al, 2000; Vecchione & al., in press; present paper). This is clear proof of how little we know about the bathypelagic, the largest ecosystem on the earth." 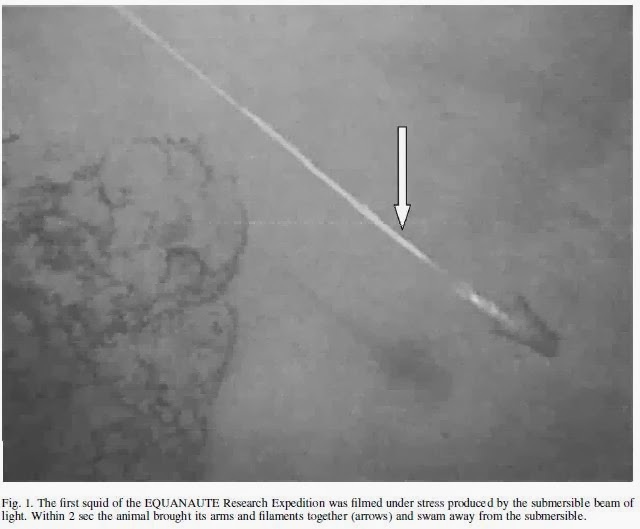 It is, indeed, amazing but not particularly surprising because of the impact that vehicles and video have had on the exploration of the bathypelagic. The difference that these tools make has not gone unnoticed and researchers are working to extend the use of video in survey work. In 1998, Euan Harvey and Martin Shortis proposed using a stable underwater video surveillance system to survey the size and quantity of specific species of reef fishes in a given area. The authors' major struggles come from calibration of the system: how do you make a remote video system as accurate as physiological information taken from SCUBA divers tasked with surveying fishes? The authors offer several suggestions, one of which is to look towards the oil rig systems that have already captured the images above. Harvey and other researchers are still working out how to get accurate information from these systems, but it is clear that stable surveillance could be one of the next steps for pelagic exploration as well. Robinson's prediction is in the offing- in November, 16 American and Canadian research teams launched "Gliderpalooza": a joint effort to survey the world's oceans using unmanned automated underwater gliders collect an enormous amount of data that will hopefully help predict weather patterns. But it isn't such a stretch to suggest that video surveillance could be added to these gliders to gather information in deeper water (these gliders only go to about 650 feet but can be used to dive much deeper). HOVS, ROVs, Stable video surveillance, and gliders are all technologies that are advancing our understandings of the pelagic environment and the animals that live there. If researchers are granted access to these tools (funding is always a problem but gliders are surprisingly inexpensive when compared to ship-based surveys), we will no longer have to label every deep-sea creature a monster when it is caught on camera. Unless they have big teeth and a monstrous intent (but only then)! I am a volunteer with the Invertebrate Zoology Department at the National Museum of Natural History and doing research on Else Bostelmann. I recently read your aquarium blogspot article, “Visualizing the Deep Sea Environment: Vehicles and Videos.” In the article, you stated that, “Beebe took notes and made drawing during the dive, and he was also connected by radio wire to Else on the boat.” I was wondering if you have a source for that information? In my reading I have not heard this comment before. Usually it states that Beebe was connected to Gloria Hollister through telephone transmission. Bostelmann then used Hollister’s notes and Beebe’s recollections to create her drawings. I would appreciate any information you could pass onto me concerning the source you used.